All Mama’s omelettes are made from 3 fresh cracked eggs. Served with country potatoes or grits, biscuit or toast & fruit preserves. A down-home 3-egg omelette stuffed with ham, mushrooms, onions & cheddar cheese. Fresh baby spinach, mushrooms, melted jack & cheddar cheese. Chorizo, chiles & onions, topped with cheese & salsa, sour cream & green onions. Diced ham, onions, green peppers, & melted jack & cheddar cheese. Include any 3 ingredients from below: Fresh tomatoes, mushrooms, jalapeños, spinach, cheddar cheese, onions, green bell peppers, bacon, ham, sausage, chorizo, grilled chicken & fresh avocado. Mama’s prepares all biscuits from scratch each morning. 2 made from scratch biscuits served open face, topped with our Southern gravy. Beer battered fried cod between our delicious made from scratch biscuits, coleslaw with tartar sauce. Over easy egg resting over our deep fried chicken breast, between our delicious made from scratch biscuits with honey. Choice of sauce: chipotle, buffalo ranch or honey mustard. Choice of side: country potatoes, fries, grits or fruit cup. Sides include your choice of 2 of the following: fries, fried okra, refried beans & country potatoes. Toasted English muffins topped with bacon, poached eggs & our own chile con queso, served with country potatoes, refried beans & salsa. 2 eggs, 2 bacon slices or sausage patty, 2 pancakes or 2 French Toast slices or 1 waffle. Any style eggs served with 2 slices of bacon or sausage patty, refried beans, homemade country potatoes, flour tortillas, & salsa. Our celebrated Migas, made with 2 scrambled eggs, fresh chilies, pico de gallo, onions & crushed tortilla chips, topped with homemade chile con queso, served with refried beans, country potatoes, flour tortillas & salsa. 2 eggs any style, country potatoes, biscuit or toast or English muffin & 2 slices of bacon, sausage patty & side of ham. Your choice of grilled meat, served with 2 eggs any style, country potatoes, or grits, biscuit or toast & fruit preserves. Mama’s hand-breaded chicken fried steak with whole kernel corn, onions & southern-style gravy. Served with 2 eggs any style & fried country potatoes. Diced, smoked ham with sauteed mushrooms, tomatoes, diced green peppers, onions & melted Cheddar cheese. Served with 2 eggs any style & fried country potatoes. Our beer battered steak or chicken served with southern cream gravy. All Mama’s tacos are made with the best tortillas in San Antonio. Please specify flour or corn. Add Mama’s Homemade Chile Con Queso to any taco for $0.49 cents. All waffle orders are served with 2 strips of bacon or sausage patty, syrup and whipped butter. Golden Belgium waffle sprinkled with powdered sugar. Texas pecans baked into a crispy waffle, topped with our roasted cinnamon apples, sprinkled with cinnamon & powdered sugar. Fresh strawberry atop our golden waffle. Topped with whipped cream. Our delicious chicken fried chicken topped with egg, prepared your way & served between our golden waffles. All French toast orders come with your choice of 2 slices of bacon or a sausage patty, served with syrup & whipped butter. 2 slices of our large sourdough bread, lightly battered with a touch of cinnamon, griddle-toasted til golden brown, then lightly sprinkled with powdered sugar. 3 slices of cinnamon raisin bread, lightly battered with a touch of cinnamon, griddle toasted til golden brown, then lightly sprinkled with powdered sugar. 2 slices of our day old sourdough bread, lightly battered with a touch of cinnamon, griddle-toasted til golden brown, then lightly sprinkled with powdered sugar. Served with 2 slices of bacon, sausage patty & side of ham. 3 fluffy buttermilk pancakes topped with our cinnamon roasted apples. 3 fluffy buttermilk pancakes topped with fresh strawberries & whipped cream. 3 fluffy buttermilk pancakes filled with delicious wild blueberries. 3 fluffy buttermilk pancakes filled with delicious Hershey’s semi-sweet mini chocolate chips. Wild blueberries in a bowl of oatmeal with brown sugar & pecans. An egg white omelette with grilled chicken, fresh tomatoes, onions, & green chilis. With white cheddar cheese & fresh avocado. Turkey bacon, scrambled egg whites, country potatoes & choice of oatmeal or fruit cup. Orange, Apple, Cranberry, Tomato or V8, Grapefruit & Pineapple. Tender chunks of grilled sirloin or chicken breast covered with a blanket of homemade chile con queso and jalapenos, on a bed of crispy tortilla chips, served with a side of homemade salsa. Mouth-watering battered mozzarella sticks, served with Mama's marinara sauce. Mama's unique twist on spicy chicken wings are beer-battered, dipped in Mama's special spicy sauce and served with our homemade bleu cheese dressing and celery sticks. Best in town! Crispy beer-battered zucchini slices, served with Mama's marinara or homemade ranch dressing. A generous basketful of fresh mushrooms dipped in our homemade beer-batter and specially seasoned flour, served with southern cream gravy or ranch dressing. Spicy steak or tender chicken fajitas atop bean and cheese nachos with guacamole, sour cream, jalapenos and pico de gallo. Melted cheese, blended with chili peppers and spices, served with crispy tortilla chips and Mama's homemade salsa. Seasoned beef or chicken fajitas and melted cheeses between two grilled flour tortillas, served with pico de gallo, guacamole, lettuce, sour cream and homemade salsa. Simply can't decide? Choose a sample of any 3 appetizers: served with Southern cream gravy and marinara sauce or ranch dressing. Ranch, Italian, Bleu Cheese, Honey Mustard, Balsamic Vinaigrette. Lite dressings available on request. Crisp mixed greens topped with tender strips of grilled chicken breast, cheddar cheese, tomatoes, boiled egg, sliced avocado and toasted almond slivers. Sliced grilled chicken breast on a bed of crisp romaine, tossed with fresh parmesan cheese, red onions and crunchy croutons. Grilled chicken breast, fire-roasted corn, black beans, onions, tomatoes, bell peppers and crisp lettuce, topped with shredded cheeses, sliced avocado, crispy tortilla strips and chipotle ranch dressing. A hearty mix of crisp greens, ham, turkey, crumbled bacon, cheeses, tomatoes, boiled egg and seasoned croutons. A homemade crispy tortilla "bowl" layered with lettuce, refried beans, guacamole, beef or chicken fajita meat, cheddar cheese, sour cream and pico de gallo, served with Mama's chipotle ranch dressing. Mama's own tortilla soup topped with crispy tortilla strips, melted cheese, pico de gallo and diced avocado. Made fresh every day! Ask your server for today's selection. Your choice of soup or salad accompanied with 1/2 grilled turkey or turkey fiesta sandwich. Your choice of soup accompanied with a house garden salad. Unless otherwise noted, favorites are served with any two of today's sides. A Texas tradition and nearly as BIG! Beer-battered steak served with Southern cream gravy or try it "Country Style", beer-battered and flat-grilled. An 8 oz. chopped sirloin smothered in seasoned brown gravy, loaded with mushrooms and grilled onions. Two thick and juicy, seasoned and grilled center-cut chops. Old-fashioned, tender, beef liver smothered with grilled onions. Mama likes hers with our thin sliced bacon for only 2 dollars more. Generous portion of classic, Southern-style meatloaf, topped with Mama's delicious homemade creole sauce. Our special marinade makes a moist, tender, and flavorful breast of chicken. Sliced blackened chicken breast on a bed of penne pasta tossed with creamy Alfredo sauce, fresh diced tomatoes and green onions served with salad and garlic toast. Our tender grilled chicken breast smothered with grilled onions, sauteed mushrooms and melted provolone cheese, served on a sizzling hot skillet. Mama's tasty beer-battered and deep fried chicken tenderloins, served with Southern cream gravy. A full rack basted with honey BBQ sauce - melt in your mouth tender! Served with fries and pinto beans. A large and tender boneless breast of chicken beer-battered and deep fried to a crispy golden brown, served with Southern cream gravy. Our choice cuts of beef are flat-grilled with Mama's unique secret spice blend, served with your choice of two sides (substitute baked potato for two sides, after 5pm only). 10oz. This is mama's own favorite! Make it a melt for $2 more by adding sauteed mushrooms and onions and provolone cheese. Our 8 oz, sirloin served with five crispy beer-battered shrimp. Delicious shrimp served your way beer-battered, grilled or blackened, with fries and cole slaw. Delicious farm-raised 8 oz. filet served your way beer-battered, Southern-style cornmeal-battered, grilled or blackened, with your choice of two veggies. Beer-battered cod fillets, served with fries and cole slaw. Trout filet lightly-dusted in lemon pepper, seasoned flour and grilled to perfection, served with rice pilaf and one side. Lightly-blackened tilapia filet, served over rice pilaf, topped with grilled shrimp and Mama's delicious homemade creole sauce, served with one side. 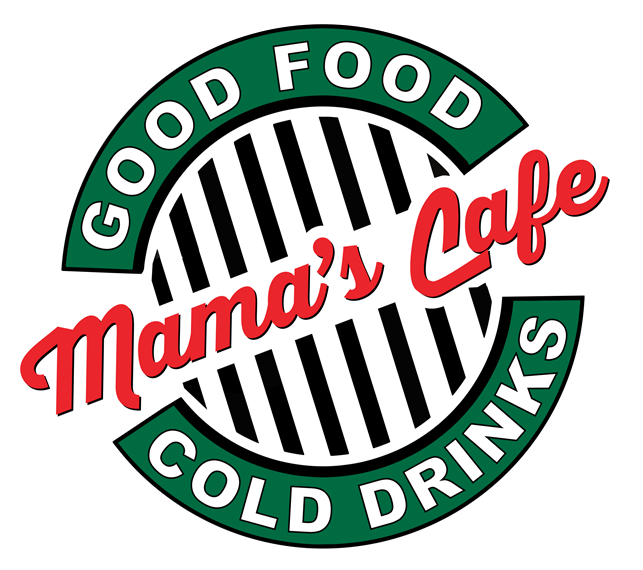 Signature blend of Texas and Mexican cuisine with a Mama’s twist. Three gooey, cheesy enchiladas topped with homemade chile con queso, served with refried beans, fresh pico de gallo, Spanish rice, flour tortillas and salsa. A spicy delight! A chopped sirloin steak stuffed with jalapenos and melted cheddar cheese, topped with chili con queso, served with refried beans, Spanish rice, homemade salsa and tortillas. Two crispy tortillas topped with seasoned chicken fajitas, refried beans, melted cheddar, fresh lettuce, pico de gallo, guacamole and sour cream. Tender strips of seasoned char-broiled beef, chicken, or shrimp fajitas, served with grilled onions, sweet peppers, refried beans, Spanish rice, guacamole, homemade salsa and flour tortillas. 3 warm tortillas filled with grilled tilapia, shredded cabbage, pico de gallo, sliced avocado, fire roasted corn, black beans and chipotle ranch dressing, served with refried beans and Spanish rice. 2 warm tortillas filled with your choice of grilled beef, chicken or mixed, served with refried beans and Spanish rice. Texas-sized freshly ground burger patties, grilled to order, on a toasted bun. Served with French fries, beer-battered onion rings or 1/2 and 1/2. Garden veggie burger available on request. Grilled burger patty topped with refried beans, onions, picante sauce, crushed corn chips, cheddar cheese and guacamole. 1/2 lb. black angus burger topped with cheddar cheese, crispy bacon, beer-battered onion and jalapeno strips, lettuce, tomato, and pickle, with chipotle ranch dressing. It's a classic - served with all the right stuff: mayo, lettuce, pickles, tomato and onions. Smothered with sauteed mushrooms, onions, and melted provolone cheese. Served with French fries, beer-battered onion rings or 1/2 and 1/2. Provolone cheese melted over thinly sliced ham and crispy smoked bacon, on toasted honey wheat bread with homemade honey mustard dressing and mayo, served with a kosher dill pickle spear. Thinly-sliced turkey breast, provolone, guacamole, mayo, lettuce and tomato on fresh honey wheat bread, served with a kosher dill pickle spear. Crispy beer-battered chicken breast dipped in spicy hot sauce, topped with lettuce, tomato and onions, on a toasted bun, with a side of bleu cheese dressing. Thinly-sliced turkey breast, melted provolone, and bacon on fresh toasted wheatberry bread. Sliced turkey breast, sweet ham, crispy bacon, provolone cheese, lettuce and tomato on thick toasted wheatberry bread. Our marinated chicken breast on a bun, with a side of lettuce, tomato, pickles and onion. The same great grilled chicken breast on a bun, generously smothered with sauteed mushrooms, onions and melted provolone. Thinly-sliced sirloin, grilled onions, bell peppers, mushrooms and melted cheese on a toasted club roll with a kosher dill pickle spear. We offer a variety of delicious non-alcoholic beverages both hot and cold! Just like the corner drugstore. Rootbeer or Coke Floats, Vanilla or Cherry Cokes too! FREE refills on soda, tea, coffee & lemonade.